Balancing, rejuvenating and relaxing. This carbon-dioxide extracted Rose Oil yields an exquisitely feminine fragrance that is more true to the flower than its steam distilled or solvent extracted counterparts. 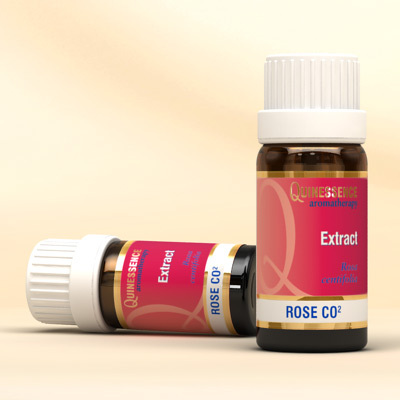 This Rose C02 extract delivers rich, sweet, fresh and radiant rosy notes with just the faintest hint of green leaf, spice and honey. Inhaling its fragrance soothes anxious and stressful states and balances the typical roller-coaster emotions of the feminine cycle. Think of romance and most people think of the rose, and it has been coveted for centuries by the ancient Egyptians, Greeks and Romans because it has a formidable reputation as an aphrodisiac! According to legend Cleopatra of Egypt and Josephine Bonaparte of France used roses to woo their lovers, and there must be thousands more undocumented cases! Used in skin care treatments Rose C02 soothes, softens and hydrates the skin whilst bringing a gentle toning action that helps to strengthen the collagen-elastin network that keeps skin soft, radiant and youthful-looking. It revitalizes dull, tired and lifeless skin, balances combination skin, and it is absolutely unsurpassed when treating dry, mature or ageing skin in need of deep moisturisation. Rose C02 reduces fine lines and wrinkles, and its mild astringent action is effective in fading those unsightly broken capillaries (spider veins) and red patches when used regularly in your skin care routine. Just add a few drops of this precious oil to a cream or lotion base and you will both see and feel improvements in the tone, softness and radiance of your skin. Please note: Rose C02 has is rich in waxes and at cool temperatures this oil will solidify. Simply placing the bottle in warm water for 10 to 15 minutes will get the oil flowing properly. Citronellol, Geraniol, Phenylethyl alcohol, n-Alkanes C17-C23, Nerol, Benzyl alcohol, Eugenol, Geranyl acetate, Geranial, Linalool.